Shredded Chilly Chicken | Simple and Delicious ! We food bloggers are compelled to watermark our pictures more than once because of plagiarism! I found many of the blogger's food pictures are copied and re-watermarked! Recently a friend sent one link to a mallu site who has stolen some of the photos from the food blogs. They do not find any problem in republishing it even without changing my "simple and delicious!" watermark! Though we left comments there, we didn't get any response. Bloggers who wish to check there , please mail me for the link.. 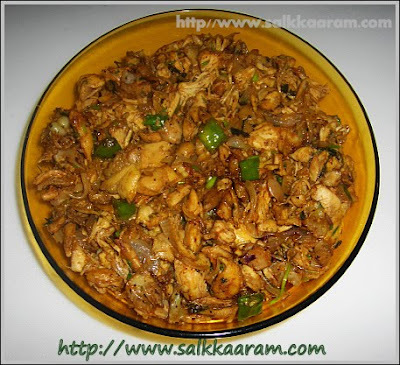 This is a simple chilly chicken recipe, which you can try out with chicken pieces from the leftover chicken curry. I had it once from a friend's house but when I wanted to make the dish once I couldn't contact her. So I tried it my self thinking of the ingredients she used to tell me.. I hope to post it again if I get the actual recipe.. This one is very good with chapatti breads and kubus.. You can make sandwiches also using this dish..
Cook chicken in enough water with turmeric powder, salt and chilly powder. When cooked , allow to cool, take out the chicken pieces. Shred the chicken from the bones. When it turns semi transparent, add garlic and ginger paste and saute until aroma comes. Add chopped green chillies, garam masala powder, pepper powder and chicken into this. Fry for few minutes on a high flame, stirring continuously. Reduce heat when chicken is little browned. Add coriander leaves , mix and check salt. Adjust the taste as you desired by adding or reducing spices. yea..even I found one site..I dunno if this is the same..
Hi Seena how are you, this looks so delicious the flavours are what I would really enjoy to eat. Just reading the ingredients make my mouth water!! Fantastic recipe, thanka! I plan to shift near you..just to have what you try..
Hey who was the one who took the watermarked pic from you ? ho.people are hyppo skinned to do that !! i like the combination to have with chapathi and kubus. I have tasted kubus when in dubai. Looks delicious. Seena, the click makes me hungry, sounds like a delicious quick fix. Jazakallah for sharing! I generally don't like shredded chicken dishes but yours looks enticing and I like that it is chilly-spiced. Ramadan Kareem to you and your family dear Seena. Ramadan kareen to you and to your family. I used to prepare in the same way except adding capsicum pieces and frying the chicken in the oil with masalas. Your version is healthy one. Am a new subscriber to your blog. I have tried a couple of recipes and I think your style is a great blend of traditional mallu and yet uniquely innovative! About plaigiarism- I am a new blogger, my blog is http://www.enrichingyourkid.blogspot.com/ In fact I have still not watermarked my pics. I used to wonder why you had watermarked your pics twice, now I understand. However if it still doesnt stop people from stealing I am wondering whether watermarking makes any difference at all. Do give me your valuable opinion as an experienced blogger. visited your blog, your recipes are very nice! Mashallah! I loved this recipe! 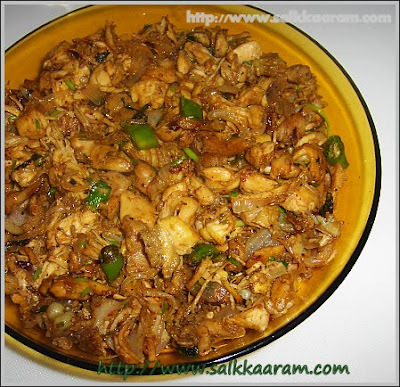 It has very little spices and hence is a very healthy version of other recipes out there. I was searching for such a recipe to use my left-over roasted chicken that I had and this was perfect! I added some tomatoes as I needed a little gravy and threw in some capsicum towards the end for some color and crunch, end result yum yum yum!